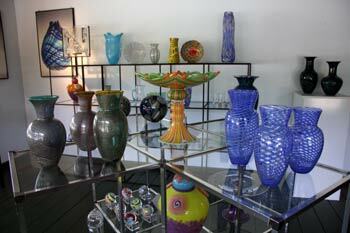 I opened my Glass Studio and Gallery in the spring of 2000 in a small town called Granville, VT, population 203. I decided on the location for its natural beauty, national forest access, and popular ski areas as well as to be close to friends and family. Finding the perfect location for my studio was difficult. One day I came across a piece of property for sale located directly on scenic Route 100 that was once a retail business owned and operated by the Mishkit Family. The Mishkit Family made and sold wood products, and deer skin products. After 30 years the family closed the store. Visitors from the area still remember coming into the Mishkit's and buying items from Mel and Jean. I started building my studio that spring. I built and purchased glassblowing equipment; Charlie Correll made my furnace, my large glory hole was made and purchased from John Chiles. My small glory hole was modeled after a John Chiles design and built by me. All of my other equipment such as my annealing ovens, workbenches, pipe warmer, pick up oven, hot garage, and various equipment was also made by me in my metal shop here in Granville. I installed shelving and lighting and repainted all the walls for a gallery space. I painted the floor and purchased display equipment, and filled my gallery with glass. I was open to the public by the summer of 2000. Over the years we have made changes and additions to the studio and the gallery. Being next to the national forest, we have a variety of visitors. Motorcyclists, international travelers, local residents, vacationers, and large groups stop by regularly. Route 100 is well know for its beauty and is well traveled by cyclists, motorists, and motorcyclists alike. My gallery is open to the public 6 days a week. 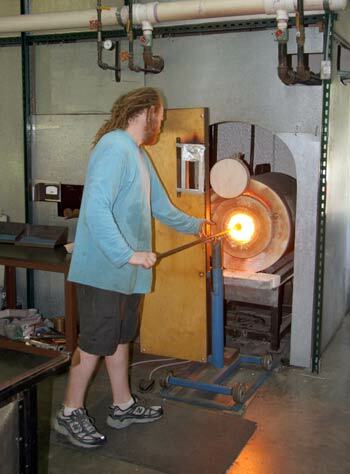 I blow glass seasonally from May through October and then November through February. It is now 2008 and my studio has become a destination for people traveling the northeast. People tell me they learn a lot while visiting my studio. Describing the process as it unfolds brings the outsider closer to the actual experience of glass working. I love demonstrating glassblowing in the presence of visitors. Even though I am a vegetarian, I am a big ham! Come and visit my studio, listen to jazz, as you watch me and my lovely wife blow glass in Vermont!